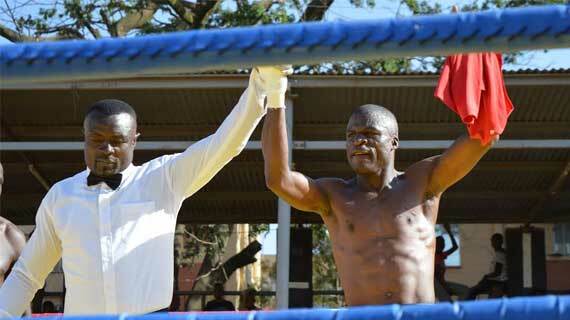 Refined boxer Geoffrey Munika knocked out Patrick Amote in a six round non-title Super welterweight fight held at the California open grounds in Nairobi county. The boxing bout brought business at the surrounding area to a standstill with a huge turn-out never seen before. In attendance was Embakasi West legislator George Theuri and other local leaders. Munika who was widely cheered by the local residents was however stretched to the last second as Amote proved lethal and equal to the task throwing heavy jabs that saw both boxers end up bleeding profusely in their mouth. The judges led by Vedo Okumu handed Munika the win amid thunderous cheers. In the Superweight category, Gabriel Ochieng stamped his punching authority to upset John Gitau with a second round technical knock-out(TKO) while battle hardened James Onyango took four minutes to knock out Ken Oyolo in a thrilling Superwelter weight category. Nevertheless, the ladies bout pitting Everlyn Adero and Susan Andeso in the Welterweight category proved a mouth watering bout as both traded heavy punches that drew wild cheers.Adero who showed a lot of resilience was later declared the winner on unanimous points decision. Earlier at the same grounds,Masa ladies trounced Kenya Homeless Street soccer Association(Khssa) 3-2 to clinch the ladies tournament that attracted over six teams. Every boxer who participated in the one-day event was awarded with a cash token of Ksh.10,000,courtesy of the California MCA. The sponsor promised to organize a mouth-watering ladies soccer tournament during Easter holiday that will bring foreign teams to spice up the weekend. Hashim said his aim of organizing the two events (Boxing and Ladies tournament) was to promote and nurture young talents. He said he will implore with the area legislator and local leaders to lay an artificial turf at the pitch with the assistance of the CDF money.